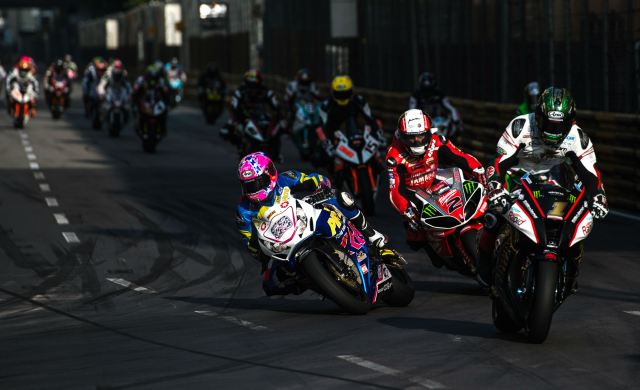 THIS YEAR’S Macau Motorcycle Grand Prix entry list has been released which include 31 riders from 11 different countries. An impressive entry for the 49th Edition includes previous winners Stuart Easton, Ian Hutchinson, Michael Rutter and John McGuinness, but the most impressive statistic is the number of riders entered. Alongside 30 other riders, Easton, who took last year’s win with PBM Kawasaki, has four victories to his name at the Macau Grand Prix whilst team-mate Hutchinson is another rider who will be returning after winning in 2013 on his return to racing after enduring 30 operations to his left leg in the space of three years. Equally another hard to beat eight-time winner is Michael Rutter who will be returning with the Penzkofer BMW team rather than the Yamaha he rode last year. BMW is still waiting for its debut win at Macau, but with Rutter’s track record it may be time this year. Rutter is joined at Penzkofer by Gary Johnson, a seven-time Macau veteran who has finished in the top five on his last six visits, and Canadian Dan Kruger who made his Macau debut last year and is looking to make substantial improvements this year. Also in the Penzkofer team is Swiss rider Hervé Gantner, who switched from circuit racing to road racing after six years, and has mixed the two since 2009. Paul Shoesmith is another experienced road racer particularly at Macau and has Australia’s David Johnson alongside him on the second Ice Valley by Motorsave Trade BMW – both will be aiming for a top five finish. Northern Ireland’s Lee Johnston will be pushing for the win at this year’s Macau Grand Prix on a Superstock version of the East Coast Construction BMW. Last year he turned a front-row start into a serious challenge for the lead. Riders Motorcycles BMW’s Martin Jessopp is another rider you can’t rule out after finishing third last year. Jimmy Storrar is also set to race alongside Jessopp on the BMW S1000RR. The final BMW rider is Peter Hickman who is becoming very well acquainted with the road racing scene and is ready to race at Macau once again. The last of previous Macau winners riding this year is TT legend John McGuinness. McPint, as he’s commonly referred to, will be riding a Honda once again alongside seven others including Manxman Conor Cummins, Daniel Cooper, Davy Morgan and Tom McHale. Allann-Jon Venter is another one to watch. Newcomers include Russ Mountford (VRS Racing Honda) - an experienced road racer although he's never ridden at Macau before. Americans Mark Miller (Splitlath EBR) and Brandon Cretu (Bimota Factory Racing) both know the Guia Circuit well, Miller especially so. Cretu renews an old association with Ben Wylie as they team up to represent Italian manufacturer Bimota who have launches a season-long campaign on the major road racing events. Ireland is always well represented in road racing and Steve Heneghan (ReactiveParts.com Yamaha), Brian McCormack (TAG Racing Honda) and Michael Sweeney (MS Kawasaki) continue the tradition. Austrian Horst Saiger continues his own Macau tradition with another Kawasaki entry; he'll be riding under Saiger-Heidger Macau Race Team and after ending last year's race in sixth place, he will be looking to equal that or better it this year.